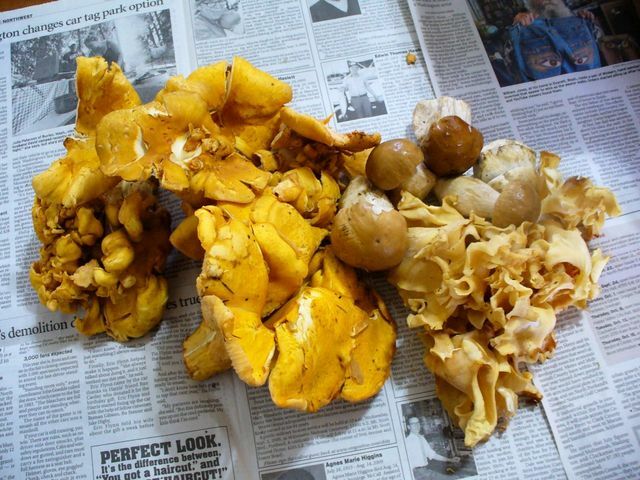 Here are some 'flowering' Chanterelles, King Boletes, & Cauliflower mushrooms. Boletes should be sauteed dry as they have a lot of moisture content or used to top pizza or similar. 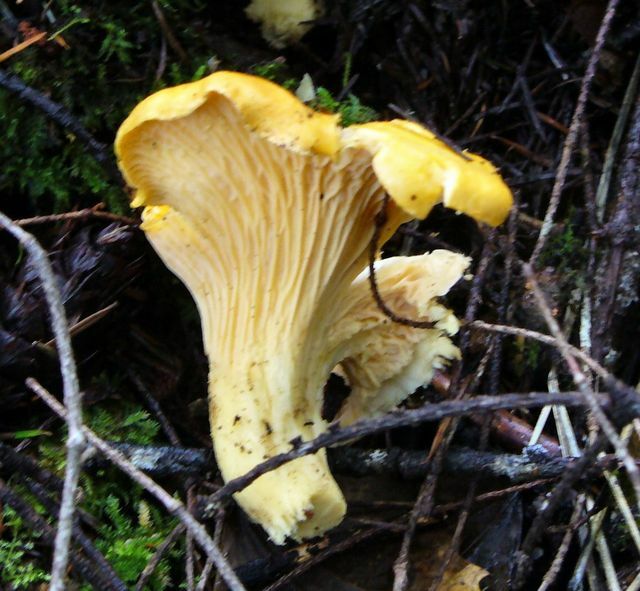 Chanterelles have a million uses for flavoring soups, as a side for steak or lamb. The Cauliflower are a thin ribbon of a mushroom that are a great substitute for noodles in chicken soup or as a base for pasta marinara (use in place of pasta or noodles.. very tasty). 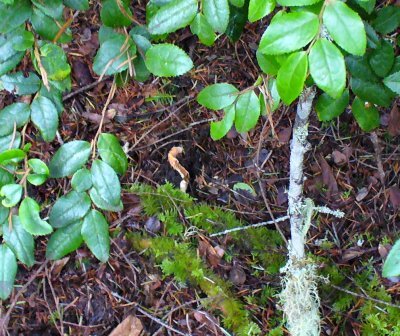 Many of these can be found in the Bull Pine duff just off the ocean or a little further inland under the Douglas Fir canopy. Its always a good idea to bring along a mushroom book or do a little internet searching before munching down as there are very deadly species around, particularly 'death cap' & amanita muscaria (gee wonder why they call it that). Do not, under any circumstances, eat a mushroom with white spots on it. 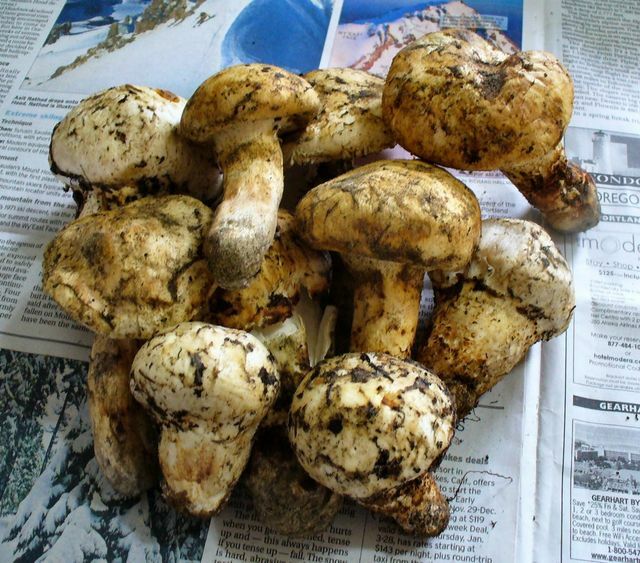 Matsutake are highly prized by the Japanese and highly appreciated by Native Oregonians. 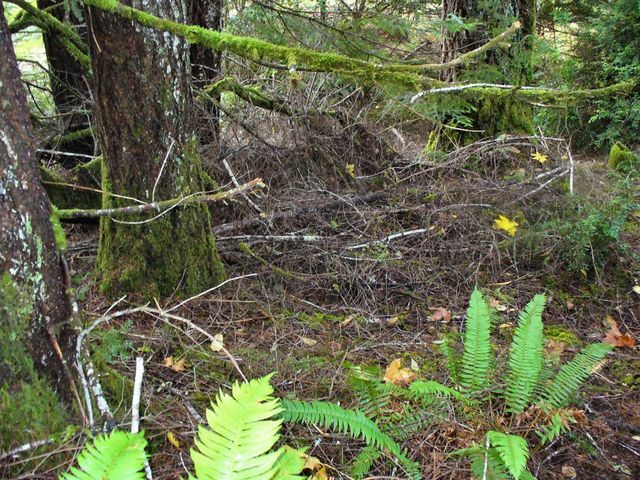 You can find them poking up from the duff under Douglas Fir or coastal Bull Pines. These are still a bit dirty. Clean carefully with a dry paint brush and then finish with a slightly damp paper towel. They're nutty full flavored mushrooms you can use in a variety of applications. We added some of these to our turkey stuffing for thanksgiving. Tasty! Another interesting find on the Oregon Coast is the Lobster Mushroom. These emerge from the duff with an orange red body that looks kind of like a lobster (funny that!). Here is a very immature one just getting going. I let that one stay in the ground. The forest floor. Are those leaves or Mushrooms?? One of the best places for Mushroom around Langlois is Floras Lake State Park. If you cross the intake and follow the lake around to the ocean and walk into the woods on the South Side you're likely to find any number of good mushrooms. Hedgehogs are particularly abundant in that area. Now that you're all fired up to go shrooming keep this in mind. Mushroom hunting tends to get you lost! Try wandering around in the woods for a few hours always looking down and then try to find your way back the way you came. It can be difficult. So remember to stop and take a look around from time to time. Look for a landmark or at least where the sun is (if you can see it). When you enter a new area, go a ways in and then turn around and look back the way you came. This will let you know what it should look like coming back out. If you do get turned around you can always 'follow the water'. Assuming you are on the Coast eventually that water will get you to the Pacific Ocean. Then you know South is San Francisco and North is Portland and Seattle -- then you're not lost anymore !! !